The infamous “lunar landing” game of December 29 gave me several ideas for stats-based topics. Today, I’m going to start with the most obvious one: Patricia Franco’s zero wager, which cost her the game. Patricia needed to wager at least 200 to have a shot against Camille’s minimum lockout bet. One of the conversations dealt with my insistence that Patricia, as I say for any player who must respond correctly to win, should have just bet everything. Others argue that a wager of 200 would suffice against a rational wager from Camille, so there’s no need to risk the possible $1,000 extra prize money that second place receives. I’m unconcerned with second place, however. I understand that $1,000 is a hefty chunk of change, but the value of winning far outweighs that. Increased potential winnings are nice, but the main point of the “bet it all” heuristic is actually to counter irrational wagers. $200 would have worked for Patricia in this case, but it wouldn’t have covered some arbitrary wager from Ashley – say, $5,600 to get to $15,000, instead falling to $3,800. Patricia responded later in the thread; since she figured there was no way Ashley would go for the suicide wager, she had no hope of winning the game. I guess she is unfamiliar with my favorite YouTube playlist: Keith drinking things. Side note: I fail to understand the mindset that one win – or two, or three, or whatever – is ‘enough’, particularly when there are huge sums of money potentially riding on each additional game you play. I plan to go into the psychological aspects of the game very soon, but that perspective has always bothered me. All right, enough with the back-chat. Let’s crunch some numbers. If you have less than the difference between first and second, you are mathematically eliminated. If you have less than twice the difference between first and second, you are still alive, but need to get it right and wager some amount to have a shot. Go for everything. We’ll look at each in turn. The population for these analyses is all regular games and all ‘win-or-go-home’ tournament matches since the beginning of Season 30 (September 16, 2013). This means I excluded tournament quarterfinals, tournament finals, Celebrity Jeopardy!, and Kids Week. This is 491 games in all: 455 regular games, 21 tournament semifinals, and the 15 Battle of the Decades preliminary matches. As is common practice, I’ll use the letters A, B, and C to represent first, second, and third, respectively. This shorthand is often useful when writing formulas. It’s happened 98 times in our chosen span. Only twice has the pre-Final leader allowed an eliminated third-place player back into contention. Curiously, they both involved future ToCers in different capacities. In my book, letting third place back into it as the leader is just as bad as a Clavin against second place. No need to ‘resurrect the dead’, as it were. Tom Imler played a great game, but made two big mistakes. A small wager on a late Daily Double kept Kerry in contention, and his wager on Final gave Pat Kavanaugh an improbable second-place finish. These days, we know all about Dan Feitel’s favorite wagering strategy: bet it all minus a dollar. Nothing prepared us for his debut, however, in which he was one incorrect response away from giving Choyon Manjrekar a chance for a fourth victory. Note that we can remove the first stipulation from Scenario 1: if third place is still alive, then second place must be alive, too. There have been 91 games that fit in this category, six of which involved that special wager-to-tie situation first equals second plus third. Once again, only twice has a leader violated basic wagering principles and potentially allowed third to win with a zero wager. Strangely, the two games are the first and last of the Battle of the Decades preliminary round. India Cooper took a narrow lead into Final against Chuck Forrest, with Jim Scott looking to play spoiler. India’s wager is needlessly reckless, putting her at risk to losing to a rational wager  and an incorrect response by Jim. More about process than outcome, certainly, but there’s no need to wager more than necessary to advance. In a similar situation – both of these fit into Shore’s Conjecture, Intermediate Form – Maria Wenglinsky held a narrow lead over Dan Pawson, with Keith Whitener hoping for a miracle. Finally, stats on whether it makes a functional difference for third place to wager everything instead of just the bare minimum. As it turns out: yes, it does. In the “Shore” and “quasi-Shore” situations, second has more than double third heading into Final (B > 2C). Until I come up with a better name, I’ll use “quasi-Shore” to designate situations where second cannot cover a zero wager by first without allowing third a chance to win. On 9 of these 24 occasions, second kept third locked out, so the discussion on those is moot. But on 5 of the remaining 15, second wagered to stay above first on a miss – making it better for third to wager everything than to just try to get ahead of first’s score with a minimum lockout wager. *A double-up by third and a minimum wager by third will, functionally, give the same result. **A double-up by third could win where a minimum wager by third would not. Here’s one of those three games that was “quasi-Shore” and for which a double-up would be much better for third than the bare minimum. This was a match from the Golden Age of Ties. Anna can wager at most 1,400 to stay at or above Ben-Hur – the first qualifier for a Shoretegic situation. 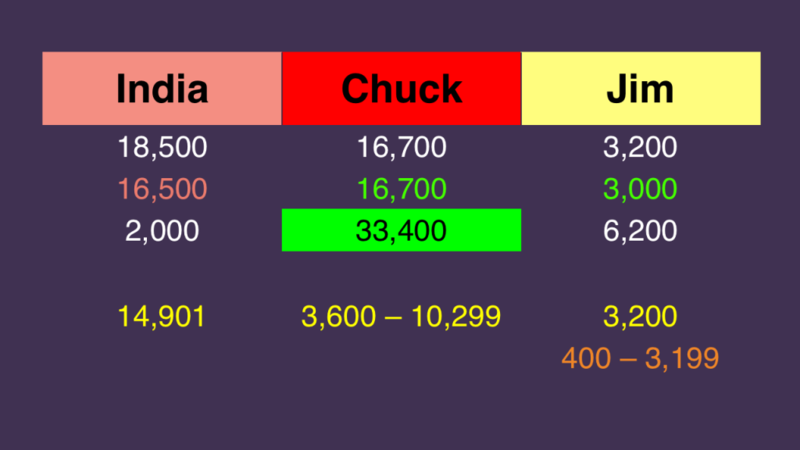 If she limits herself there, however, Ed can win with a zero wager (which is why I call the scenario “quasi-Shore” – kinda like Shore, but not quite). 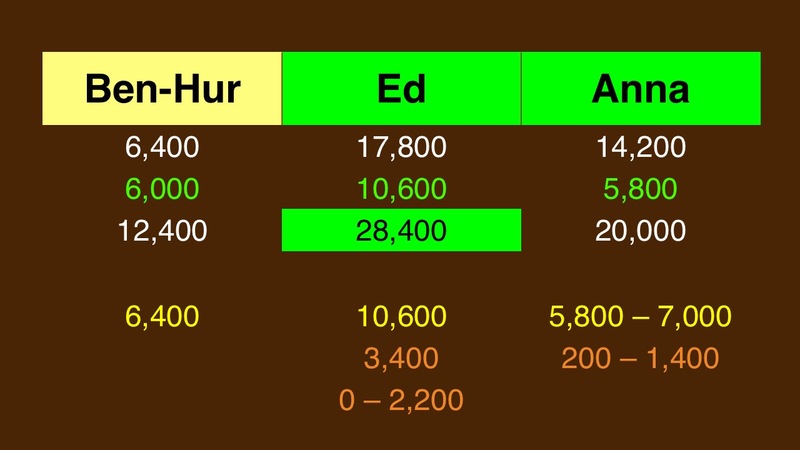 If Ed misses with that lockout wager, he’ll have 7,200, so Ben-Hur might be tempted to wager 800 to tie him. But Anna will have 8,400 if she misses, turning what could have been a win for Ben-Hur into a loss. If you are in third and must respond correctly to have a chance, wagering everything is never worse than wagering less than everything. In game theory terms, we call this a weakly dominant strategy. In other words: always wager everything if you have to get it right. This assumes you are playing to win, of course – and if you’re on the show, you’d better be playing to win. I prefer to think of my second-place finish as “plucky,” rather than improbable, but OK. This is why I send people to the Final Wager. Thank you very much, good sir!